Обсидиановая ферма - это эффективный способ получить обсидиан. Когда магма контактирует с водой, тайл обсидиана появляется на месте соприкосновения обеих жидкостей. Обсидиан является умеренно-ценным камнем и если учесть то, что запасы магмы и воды возобновляются, то можно считать это бесконечным товаром. Прямоугольный зал, выкопан или сконструирован в 2 уровня высотой. В более продвинутых фермах можно использовать несколько слоев магмы и воды - еще один обсидиановый слой (N - число слоев магмы, (N-1) - число слоев обсидиана). Ваши изобретательные дварфы, должны закричать: "ОБСИДИАНОВАЯ КРЕПОСТЬ! ", прямо сейчас. Верхний уровень содержит резервуар воды, пол выкопан и заменен выдвижным мостом (показан фиолетовым) для сброса воды по требованию, и, опционально, подъемный мост (белый) для контроля потока воды; Комбинация этих мостов даст в итоге дозированный резервуар, который будет сбрасывать воды не больше, чем для этого необходимо. Также можно добавить дверь для целей обслуживания. Middle level is an access room; floor may be channeled out or ramped out from below, but it should not be there. 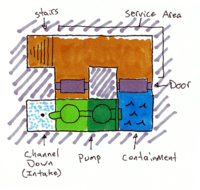 It should include an access door, and drains to remove excess water (shown in cyan); the spare water may be pumped back to the reservoir, dumped in the caverns or an aquifer, or left in a large room to evaporate. Outside the farm must be two levers; one controls the bridges in the water reservoir, one which controls the magma floodgate. Lower level is the magma reservoir; the floor should be intact. The magma supply should be controlled by a magma-safe floodgate (shown in green). Again, this level may include a magma-safe door for maintenance access. 6 mechanisms (8 if measuring reservoir is used), one of which must be magma-safe. 3 z-levels you're willing to dedicate to an obsidian farm, with easy access to water and magma. Open the floodgate and flood the lower level with magma. Retract bridge and drop the water onto the magma. Wait until any excess water has drained away. Mine the obsidian using channels/ramps. Haul the obsidian stones to a stockpile. As a bonus, the obsidian casting process can also serve as a convenient soap maker garbage disposal. Make sure that the Temperature setting is enabled in the d_init.txt file for obsidian farming to be feasible; otherwise, the tiles will not cool down after the obsidian is formed, and dwarves will refuse to get close, thinking it incandescent despite no magma being present. Keep in mind all usual precautions for handling big amounts of both water and magma. Unlike water, magma normally flows very slowly and pressure doesn't affect magma at all. Because of this, it's always preferable to pump magma rather than letting it flow, even when the obsidian farming chamber is on the same z-level as magma, or it might take much longer than you'd expect. Pumped magma however will be pushed up by pressure, up to the z-level of the pump. When pouring water over magma without dispensing the exact amount, you'll probably end up with excess water on top of the obsidian. Make sure your design includes a way to easily dispose of this water. For the same reason it's usually better to drop water onto magma and not the other way around - excess water is much more manageable than excess magma. Remember to turn off any inflow before digging out obsidian, or the moment the obsidian holding it off gets dug out it will resume flowing, likely leading to !!Fun!!. Note that if you add water to a tile which is as little as 1/7th full of magma, you'll create a full block of obsidian. This is particularly useful when you're operating a repeatable magma piston since one block of obsidian will displace 7/7 units of magma, and you'll only need 1-2 units of magma to make a block of obsidian to get 7 units of magma. Последнее изменение этой страницы: 23:26, 23 октября 2018.